One of the biggest challenges we face in the online marketing world is to keep up with what the search engines are doing so that we can help our clients promote their sites online. Over the last couple of years Google and the other search engines have been moving the goalposts and we web folks believe that it’s now time to focus on content marketing. Now if you’re not so familiar with content marketing it revolves around the content (pages/blog posts/articles/news/testimonials/portfolio etc) that you have on your website, your social media or what you create for other sites (such as other blogs and article sites). The main thrust now is to build trust, credibility and authority by showing off your expertise and usefulness in your market. We’ve moved ‘from hype to help’ in marketing. And this seems to be what Google and other search engines seem to working on. This means that you’re going to have to get to grips with and focus on content marketing for your business if you want to do well online. Gone are the days when you could put simple meta-tags into your site and let the search engines do their stuff. It hasn’t worked that way for a while now but far too many website owners seem to think that it’s still all they need to do. You need to write stuff, add stuff, discuss stuff, shout about stuff. And always with the view of keeping website visitors coming back for more. The simplest way of doing this is to have a blog on your website (give us a call if you need help with this) because it’s a quick way of generating content. However, it’s also a simple way of getting more attention from the search engines. I know we’ve written about it before but Google Loves Blogs. But you could also have your Twitter posts embedded into your website too, or maybe your Facebook page feed. Both of these will mean that there is content activity happening on your website. This means that each time the search engine robots visit your website they’ll see something new. And having something new will mean that they’ll give your site more credibility when compared with your competition who doesn’t have these things. However, there is something of a caveat with this: You need to be consistent. If you’re going to add to your Facebook page or Tweet each day then make sure it gets done. If you’re going to blog each week the same thing applies: make sure it gets done. One of the big frustrations is to visit a site where the information or the articles and blog posts are all out of date. And the search engines notice this too. Think of it this way: the search engines won’t rank your content as relevant to a current audience if it’s not been updated for some time. 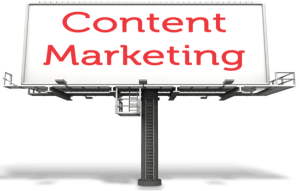 So, with that in mind it’s a good idea to develop some kind of plan of action to help with focus on content marketing and we’ll be writing about that very soon. However, if you’re already working on a content marketing plan then let us know about it in the comments section below. Couldn’t agree more Karl, and a couple of tips are: Have an exciting Headline to draw readers in, then say everything in one Paragraph, for the big picture people, then add more details and of course your contact info. Easy! Thanks Tina, and you’re so right. Use a headline to catch their attention and the opening few lines to get them wanting more.